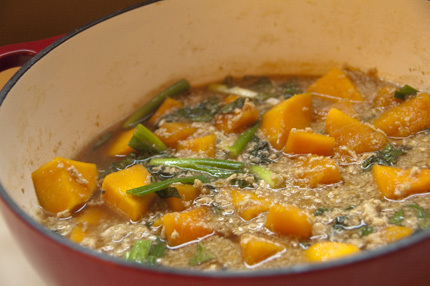 When I saw Heather’s post on simmered Japanese pumpkin, I was reminded of a simmered pumpkin dish my mom makes. When I told Mom I was going to blog about it, she laughed. "They’re not going to want that,"she said. Whenever she says they, she means non-Thais. She has lived in the US for 30 years now, and although Thai food is immensely popular, she is under the impression that most Americans wouldn’t care for any of the simple foods we eat at home. Mom is absolutely right in saying this is a simple dish, but it is very comforting as well. I think anyone can appreciate that. This was the first time I made it myself, and as I sat eating it, I was momentarily transported back to Mom’s kitchen. I can’t remember the last time that happened to me. That alone is enough to make it worth blogging about. Heat a wok or medium-sized pot (with a lid) over medium heat. When hot, add about 2 tbs oil. Add the garlic and half of the basil leaves, if using. Sauté briefly. Add the eggs, scrambling in the pot. When the eggs are just set, add the pumpkin and sauté for about a minute. Add the oyster sauce, soy sauces, sugar and water, stirring to mix well. Bring to a boil, then lower the heat all the way down to a simmer. Cover and simmer until the pumpkin is just tender, about 20 minutes. Adjust to taste as necessary with more soy, sugar or water. Add the green onions and turn off the heat. Let the pot sit covered for about 5 minutes. Just before serving, garnish with the remaining Thai basil leaves. With a dish like this, serve with a spicy dipping sauce on the side. This is easily made by combining an equal volume of lime juice (or white vinegar) with fish sauce adding sugar and either fresh chilies or chili garlic sauce to taste. Another good accompaniment would be salted crispy fried fish. No salted crispy fried fish? Pan-fried kippers are a good replacement for the flavor. Just pan-fry the kippers until they are slightly crispy and dry-looking. Don’t worry, they won't really be dry! And of course you’ll need plenty of steamed jasmine rice too.